This Stick Style residence was built in the Railroad Addition in 1894 during Ashland's heyday as a division point on the Southern Pacific Railroad's Shasta route through the Siskiyou Mountains. The main line railroad passed through town less than two blocks north of here. Pelton was sheriff of Ashland at the time his house was constructed. 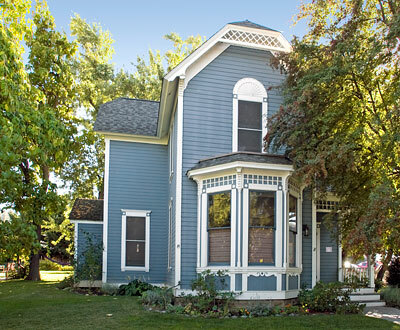 The Pelton House is one of the outstanding examples of High Victorian residential architecture in Ashland. Along with the H. B. Carter House (1888) and the G. M. Grainger House (1890), the Pelton House is among the best representatives of the Stick-Eastlake style locally. The Pelton House is attributed to the accomplished local builder William J. Schmidt, who, four years before constructing the Pelton House, employed Eastlake trim of kindred character on the Grainger House. In the same year that he built the Pelton House, he commenced work on the Trinity Episcopal Church, which also is located in the Railroad Addition. Adapted from the NRHP nomination submitted in 1993.